Ok. That’s pretty broad and all-encompassing, but then so is God. 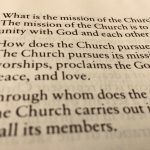 Next question: How does the church pursue its mission? The church pursues it’s mission as it prays and worships…so being here…participating in this service…no matter what that participation looks like—if you are here—you are carrying out the mission of the Church. 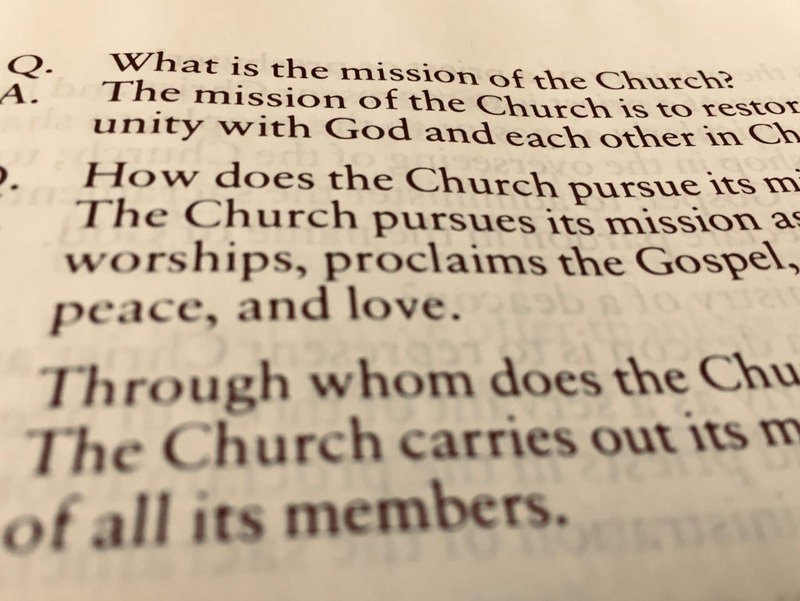 But the church also pursues its mission as it proclaims the Gospel…that one requires a bit more than just being here…but remember Gospel simply means “good news”…and remember that our baptismal promise is to proclaim the Gospel “by word and example”. We proclaim the Gospel as much by how we live, how we treat others, how we work together toward common goals as we do through the words we say. In other words, to paraphrase St. Francis, “preach the Gospel always, use words if necessary.” But the words are still important. Being able to say, “I’m a Christian”…or it’s because I’m a Christian that I do X, or believe this…” That’s really important, and probably a lot scarier in this day and age, than just being a good person. It might require more courage. The church pursues it’s mission as it prays and worships, as it proclaims the Gospel…and promotes justice, peace, and love. There you go…it’s about how we live in the world. How we live in God’s world as faithful people. Through the ministry of all its members. That’s you…and me…and as our reading from Acts points out…All on whom the Holy Spirit descends…it’s foolish to think that God’s work can only be done by only a certain group of people. So what is your ministry? It’s to carry out the mission of the Church… “to represent Christ and his Church, to bear witness to him wherever they may be”…wherever you go, you are representatives of Christ… “and according to the gifts given them, to carry on Christ’s work of reconciliation in the world;” So, based on the gifts given to you by the Holy Spirit—your natural skills and abilities, or even just the tasks that you are called into, you are to go out—as I try to remind you every week—to go out and do the work God has given you to do—be engaged in God’s mission of restoring and reconciling. Whether that is as a student, a teacher, a lawyer, a financial analyst, a doctor, a nurse, an administrator, a small business owner, a parent, a grand parent, a child, a sibling…whatever it is you do for the other 167 hours of the week…that’s the mission of the church. What we do here…and what we do when we’re not here. I told you, it’s all encompassing. The fifty days of Easter are drawing to a close. Thursday (the 10th) marks the Ascension…the day the risen Christ ascends to the Father…on Pentecost we receive the Spirit and are empowered to carry on his work. Jesus, today, is getting us ready for this. Today, he reminds us—just as Kathy did last week—to abide in him…to remain attached to him—like branches are attached to the vine—remain attached through worship, and prayer, and community…we can’t do this alone. Abide in his love. Remain in his love. Stay attached to his love. Live out his commandment, which is what? “love one another as he has loved us.” Abide in that…and live it out…carry it out to others. “I appointed you to go and bear fruit, fruit that will last.” The fruit of restoration, the fruit of reconciliation, the fruit of peace, justice, and love…the fruit of mission. As Easter draws to a close, Jesus is preparing us to be sent out…to visibly be his followers in the world…and today we’ll have some practice. At the end of the service, all are invited to join in a Rogation Procession around the church…you can read about it in the bulletin…we’ll go out of the church and offer prayers for our neighbors, for our common life, and for all creation…which we are called to restore to unity with God and one another. That’s one way we’ll practice. Another is a “listening project” The Mission and Outreach Committee, with the help of many others in the Parish and a team from Episcopal City Mission, are undertaking. Over the next few weeks, a group of about 14 of us will be going out and inviting 3 or 4 people one at a time into conversation about what “mission” means here at All Saints. How are we living out God’s mission in this time and place? The goal is to hear your stories, your passions, and your questions about mission and outreach, so that the Mission and Outreach Committee can be more responsive to the work that matters most to you. So that we can understand where God is calling us as a community to be focused in the next several years. To listen for those places that are longing for reconciliation, and reconnection. We won’t be able to get to everyone before the Mission and Outreach retreat on June 9th. But I hope these types of conversations can and will continue. Abide in him…and love one another…and God’s mission will be fulfilled.